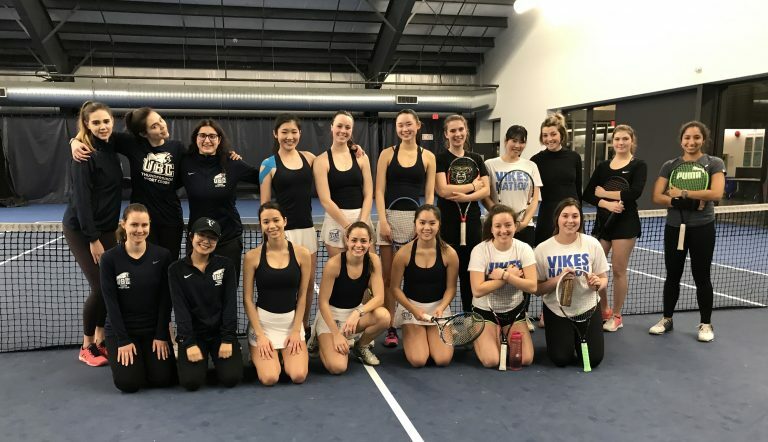 The UBC Women’s Tennis Team swept their match on Saturday, January 19th at the BC Regionals hosted at the UBC tennis centre. The Thunderbirds recorded a stinging total of nine victories against the University of Victoria Vikes to earn a spot at the Western Canadian Championships, a qualifier for Nationals. The night started off with wins by all three doubles teams. The No.1 team, Jessica Silva and Madi Fan, polished off their match with an 8-0 win. The No.2 team, consisting of returning players, Abi Heninger and Yizhen Song, won their first match of this season together, 8-1, and clinching the doubles point, Luna Crawford and Michelle Lim won their match at No.3 without dropping a game, 8-0. Singles began with play by No. 2 Fan, No. 4 Lim and No. 5 Crawford. Fan played against Camille Hémond, a previous BC junior, and attained a straight set win of 6-2, 6-4. Following suit, the UBC Women’s players won their matches in full force. Lim cinched a 6-0, 6-1 W against Hannah Ack, while Crawford did not drop a game and beat Chanelle Moisson, 6-0, 6-0. No. 3 Heninger served her way through a 6-0, 6-0 win, while Nina Erdevicki stepped up to the plate to play the No. 6 spot and won with confidence, 6-0, 6-3. Finally, Silva at No. 1 wrapped up the match and scored UBC’s 7th point with a 6-1, 6-1 win against Haruka Kajino. Next for the UBC Women’s Team, is a community outreach match against Tennis BC Juniors at the UBC tennis centre. It will be hosted on Saturday, January 26th from 6-9:30pm. Come out to watch the Women’s Tennis Team battle it out with the up and coming juniors! UBC and UVIC take a pre-match picture.